My father, George, was from King Island – a tiny island rich with marine life, located in the Bering Sea of Northwest Alaska. Our ancestors inhabited the land for millennia, and my father was among a small group of Iñupiat who lived on the island until the 60s. After my father left the island, he raised his family in Juneau and Anchorage. My father worked on Alaska’s North Slope, driving oilfield workers from camp to camp. During hitches at home, he carved animals from walrus tusks. He carved beautiful loons, swans, puffins, and whales, and sold them to art collectors. He was intimately familiar with these animals from living on King Island. He was a perfectionist. He would study photographs, make sketches, and then saw, sand, etch, and apply ink to an ivory piece until he was satisfied. He followed the footsteps of his father, Peter Mayac, and became an excellent ivory carver. My mother, Imelda, was from the Philippines. She worked in social service, but had a passion for cooking. She loved to deliver special cooked meals and baked goodies to friends, and insisted on making everything from scratch. She took me and my siblings to countless gatherings and potlucks, and everyone looked forward to her delicious food. My parents liked elegant things, authentic items, and items that required attention to detail. Both my parents have passed away, and I believe their creativity and fondness for beautiful things have passed on to me. My first experience with beads was in elementary school. We had a special curriculum teacher who taught students about Alaska Native culture. 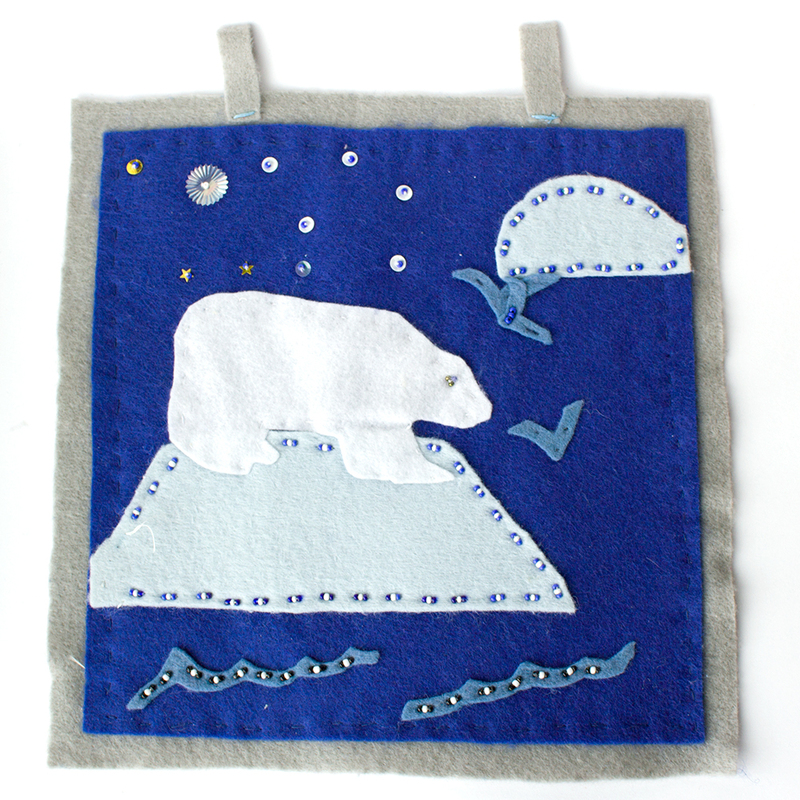 Because beading is deeply rooted in Alaska Native culture, she taught my class how to sew beads and sequins onto felt. I remember making a landscape with polar bears floating on top of ice. After my mother passed away, I was surprised to find my landscape tucked inside her papers. Soon after this, I wanted to make beaded jewelry. I bought beads from Joann Fabrics and kept them in a tackle box. Using my imagination and recalling beadwork from gift shops, I made a handful of necklaces and fringe earrings. My dad noticed my interest and carved special ivory components for me to use in my bead work. 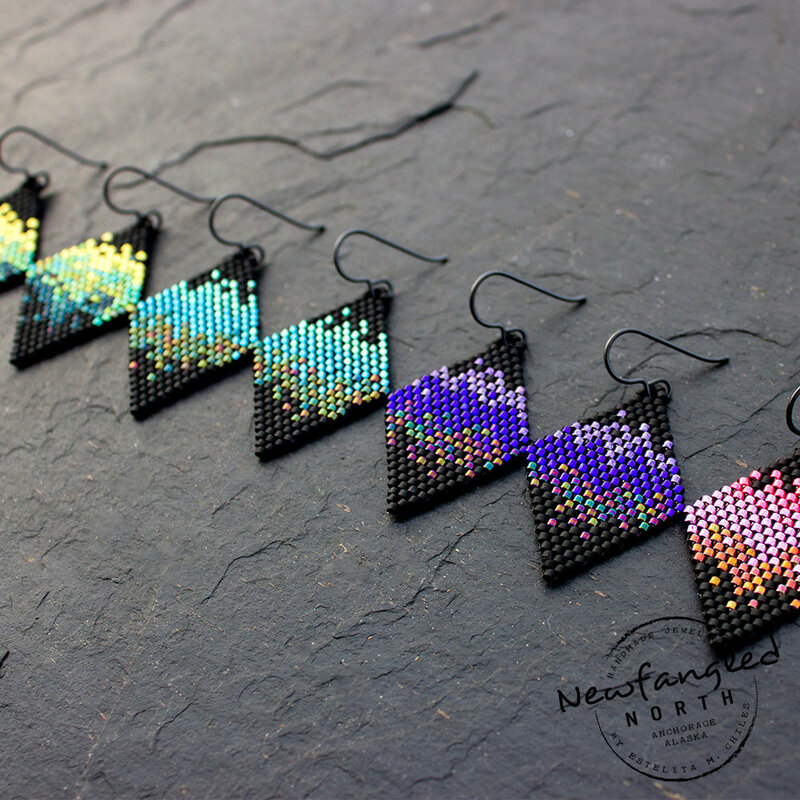 Around 2010, my close friend Kera was interested in learning how to bead, and it was her interest that re-sparked mine. I dug out my bead stash, bought a few books, and learned how to do stitches like peyote, herringbone, and spirals. My interest in beading spiked in 2013 when Kera introduced me to Pinterest. At that point, my hobby turned into something like . . . an obsession. Pinterest made it easy to browse photos of beaded work from around the world. The styled photos were like eye candy to me. Before, I limited myself to books and random beading sites – sites I would bookmark in my browser but never return to. Now I could pin photos of beaded jewelry or tutorials on Pinterest. Pinterest widened my perspective of the beading community. It also inspired me to try more complex designs. Pretty soon, it was beaded jewelry for everyone! My bead style is modern, and ranges from simple to ornate. I draw inspiration from many things – nature, photographs, people, my experiences, and my culture. While my designs can be described as modern, they are also elegant. I believe my Aurora Earrings is a good example of my bead style. I capture the Aurora in a classic diamond shape using a swath of pixelated greens, blues, purples, and pinks. I think about my parents often, and how their habits and love for elegant things reflect in my beadwork. I think about their talents, and how they have influenced my interests today. 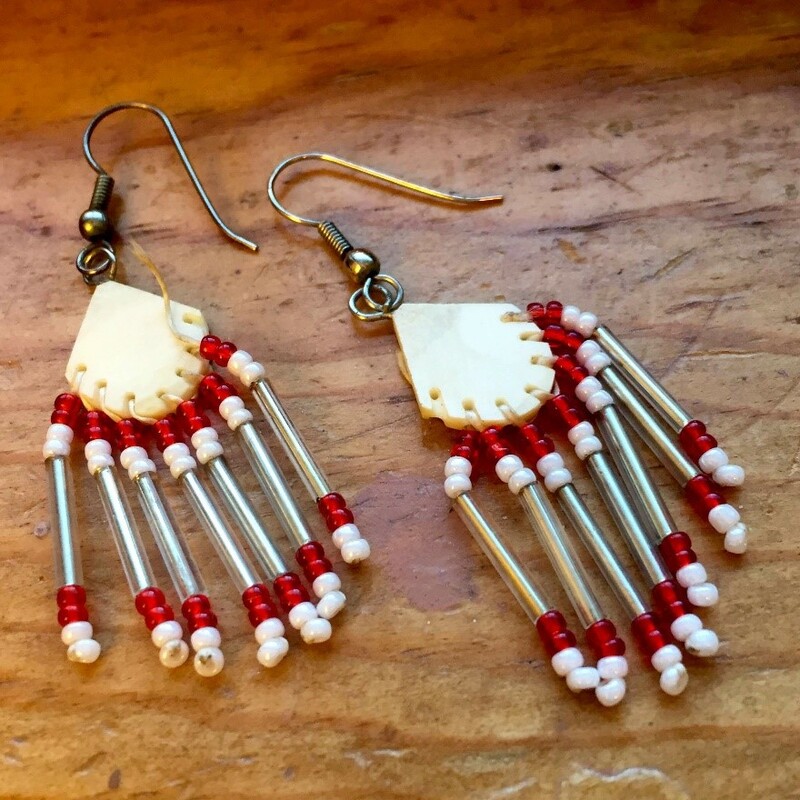 I started to sell my bead work in 2016 to pursue my love for beads, connect to my Alaska Native culture, and be within a positive environment. I’m thankful for the opportunity to share my work with the world. Visit my Etsy Shop or see current Events to shop. Find more of my beadwork on Instagram, Pinterest, and Facebook.